In this race to the finish game, students battle in groups to be first at the top of the mountain. Select from 3 different mountains to climb for different length of play. ​- Mount Washington for 10 question games or more. - Mount Kilimanjaro for 15 question games or more. 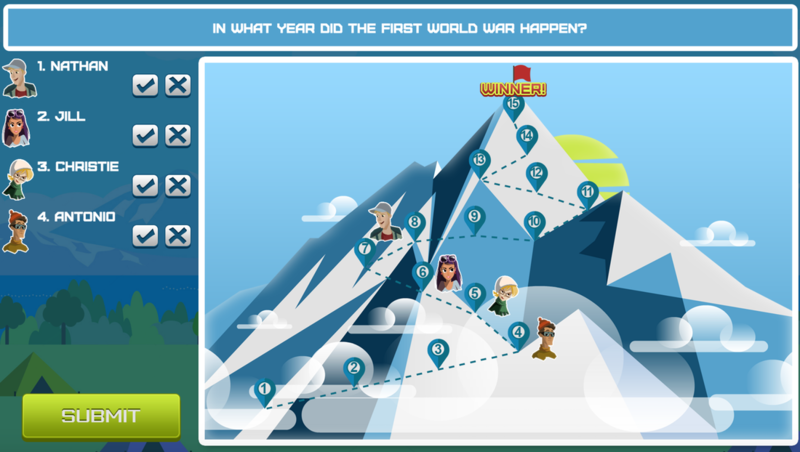 - Mount Everest for 20 question games or more. Select and play with 6 different characters. 3. Select a climber and name for each team of students. 4. Start the game by asking all teams a question. 5. Enter correct or incorrect for each team. 6. Watch the climbers battle to reach the top first!